Video parts 2 and 3 at the bottom of this page. Background: When I started racing SUP competitively, I realized that to get faster and be one of the top racers, I would have to put in more training time. Downwinders are the most fun and we are lucky to live in Honolulu where we have the Hawaii Kai to Waikiki run, a nice downwinder. It usually takes us less than 1.5 hours to complete the paddle but with shuttling cars between start and finish, loading and unloading boards and gear, showering, changing, etc., it usually takes more than 4 hours to do this. I have a business and family so for me to do a downwinder more than once or twice a week is not realistic, so I was looking for ways to get a paddle workout in less time. I started doing round trip sprints which take less time but was still not able to do this on a daily basis. So, I used a paddle shaft from a paddle with a broken blade and attached a hook to it. I built a pulley weight system to hook up to it and the first SUP paddle trainer was born. I found this setup worked well for strength training with heavier weights. Most gyms have pulley weight systems and if you have a training paddle shaft you can hook it up to any cable weight system. I also tried stretch cords, which provides a good basic workout. 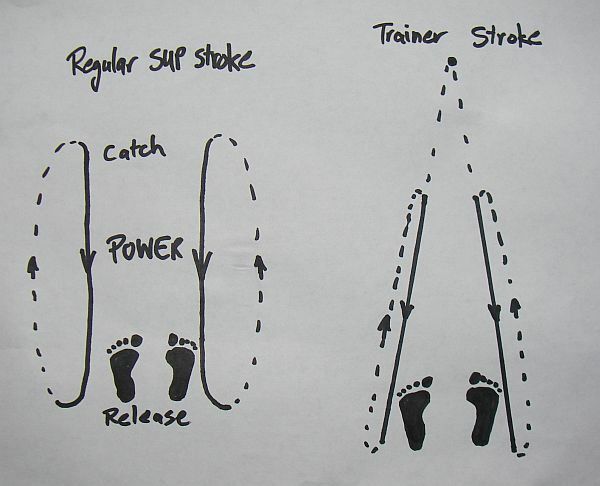 A SUP simulator kit using stretch cords is now available at http://www.paddlecoretrainer.com/, see below. The weights and stretch cords provide resistance during the pull and the recovery. When paddling you only have resistance on the pull, not the recovery. 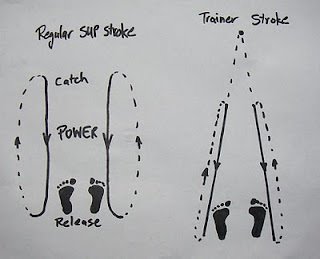 So, I started researching rowing machines (that provide resistance only on the pull) to be modified into a SUP trainer. A friend told me to check out the First Degree Fitness E-216 model and I found it to be the most suitable as a SUP trainer for the following reasons: Cable pulley: Some machines, like the popular Concept 2 rowers, work with a chain drive, which is fine for rowing as the pull is straight out but not for SUP training as the pull is diagonally to the sides, which puts too much strain on a chain. The E-216 has a tough Dyneema cable (rope) that works well. Adjustable water resistance: The water level in the resistance chamber can be adjusted instantly with a lever, which allows the resistance to be changed quickly for different users or workout intensity. SUP training requires a lower resistance than rowing training, so it’s important to be able to adjust the resistance. The water level in most water rowers can be lowered manually but only the First Degree Fitness rowers allow instant adjustments. The water resistance provides a realistic catch, power phase, and recovery. The moving water in the tank even sounds much like a real stroke. Note: We no longer sell this model, we now use a Vasa Spacesaver unit instead (see version 4.0). To make the experience more realistic, I built a balance board that simulates the balancing required on a board. After much experimentation and prototyping, we came up with a design that works well. It allows side to side balancing but will not twist or rotate if used on a grippy surface. I modified the rower by removing the seat and track assembly and replaced the rower bar with the SUP paddle shaft. Tips: Shortest paddle length is easiest to pull. Take full strokes as monitor might not record very short strokes. Pull cable straight out from machine and recover same way (see illustration). Avoid recovering faster than cable retracts. That’s it. It works surprisingly well and can provide a quick full body workout anytime. 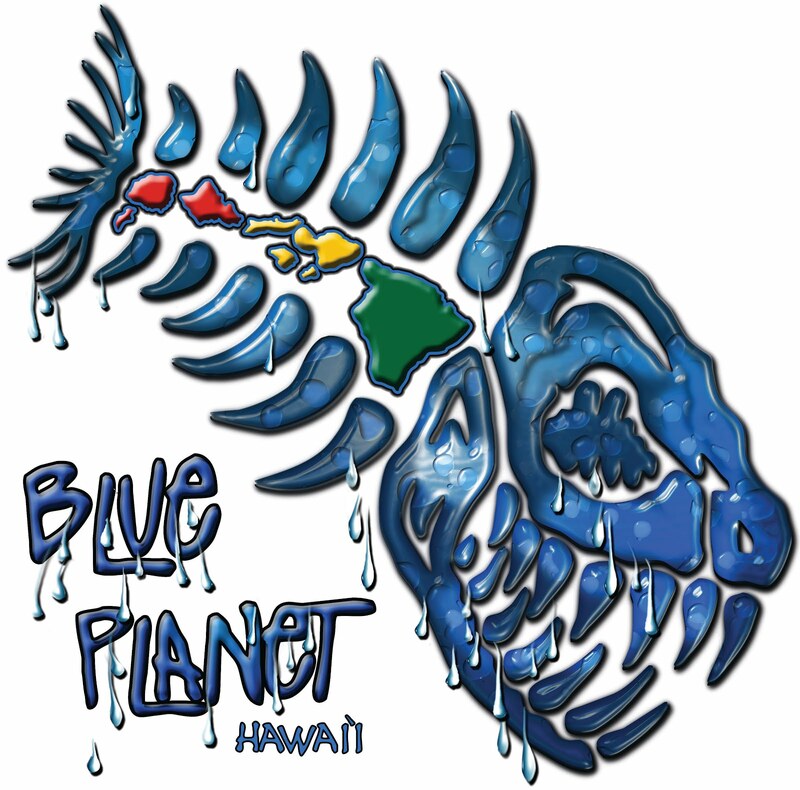 If you are in Honolulu, come by the Blue Planet Surf Shop on Ward Ave. to try it out. The version 2.0 and 3.0 models have been sold as well and we moved on to version 4.0. We are now also offering the Paddle Core Trainer Kit, a SUP simulator kit that includes a three piece adjustable paddle, balance board, stretch cords, accessories and instructional DVD. 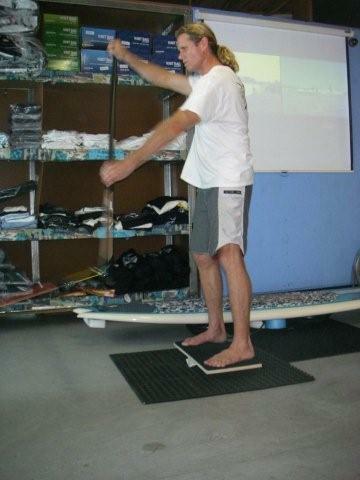 Vasa SUP trainer features from Zen Waterman on Vimeo. Very nice post. I just surf your blog and wished to say that I've truly enjoyed surfing around your blog posts. In any case I will be subscribing to your feed and I hope you write again very soon!